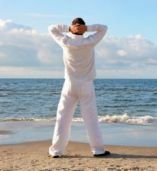 How to Overcome Tiredness, Fatigue & Lethargy! Every guy has had one of those days where he wakes up and has nothing. No drive, no motivation, no libido, no zest for life. I call them low T days, and they're no fun at all. No matter how good you are with exercise, diet, and supplements, every once in a while, you're going to get hit. When you do, your testosterone is going to fall down into the basement! At this point you can just give in and suffer through it, but I don't think that's a good idea. Personally, I'm not even a little bit interested in spending a day on the couch watching TV, napping, playing video games, or whatever. Because one bad day usually leads to another. Fail to put on the brakes, and you can slip into a low grade depression that can go on for a week or more. Rather than suffer, I prefer action! Action, movement, and achievement are all pro testosterone. Lethargy, laziness, and lack of motivation are all anti testosterone! When you're having one of those days, follow the methods below, and I guarantee you, you'll crawl out of your hole and get back to the business of living life, fast! 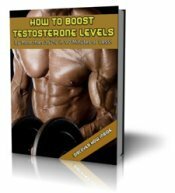 Tongkat Ali is one of the most potent testosterone booster I've ever used, and I've used a whole lot of them. On days when I'm low T, I like to take a nice big dose of the stuff. If it's been a while since I've taken it, and I hit it just right, it can have a profound impact on my testosterone levels, my motivation, and my outlook on life. Perform a Heavy Leg Workout! High intensity, short duration workouts cause an immediate and powerful releases of male androgen's into your blood stream. When I'm having a low T day, exercise is usually the last thing on my mind, but I know I'll be better of if I get up and do it! My exercise of choice on these days are squats. Within 15 minutes of completing an intense squat routine, I begin to feel the hormonal surge, and accompanying mental lift that always follows a good workout. Get Outdoors in the Sun! We all know how good it feels to get outside in the sun. Because vitamin D is not really a vitamin, it's a hormone. A hormone that works as a building block for many of the other hormones produced in your body, including testosterone. No matter how unmotivated you are, you have to get up and get productive! Lay around, and you'll feel bad about yourself. As a result, your testosterone levels will decline. Take action and get productive, and you'll be rewarded with a nice surge of testosterone. Once you get your T back, all will be good in the world again!